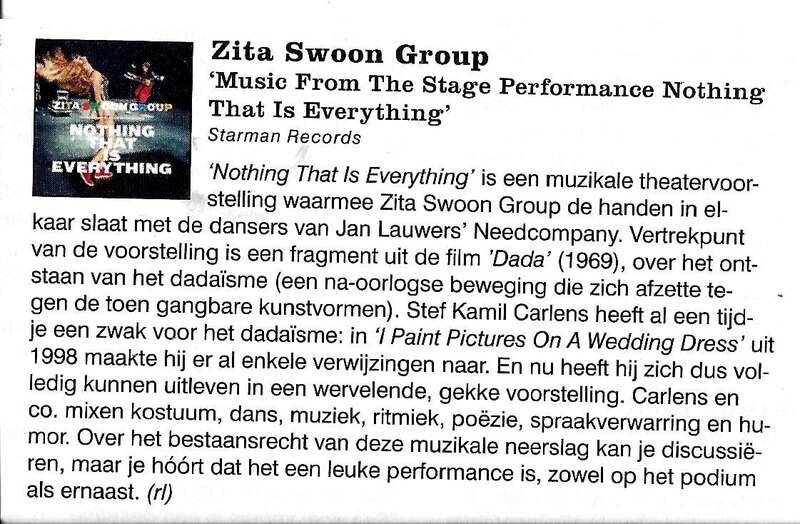 It is with pride that we announce the release of NOTHING THAT IS EVERYTHING the new album with the music of the performance of the same name by ZITA SWOON GROUP, the collective of Stef Kamil Carlens. 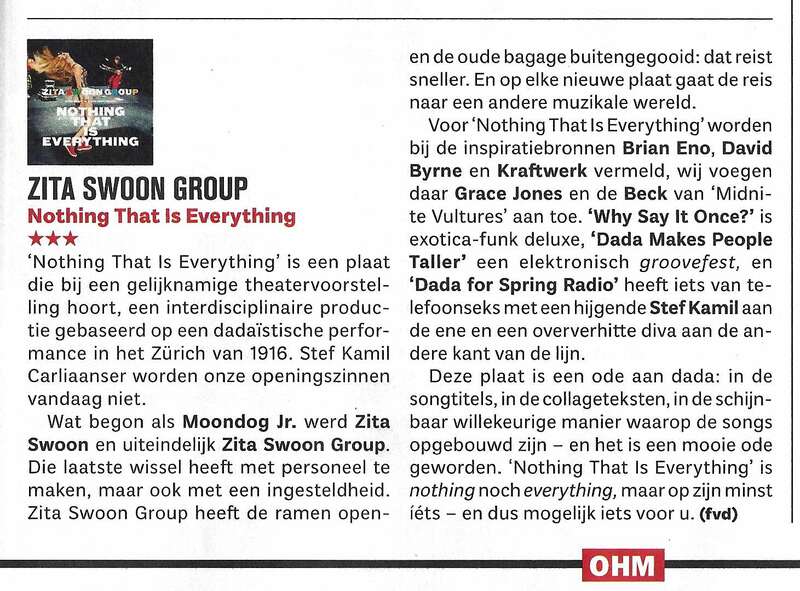 “NOTHING THAT IS EVERYTHING” is released CD and vinyl. This is a very adventurous yet accessible album on which songs and instrumentals alternate. An exceptional work for those who enjoy the atmosphere of Eno, David Byrne, Talking Heads, Kraftwerk… from a group following its own path with great panache. 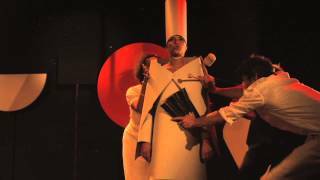 For “Nothing that is Everything” Stef Kamil Carlens and his cronies made a creation inspired by a Dada performance that took place at the Cabaret Voltaire in Zurich in 1916. 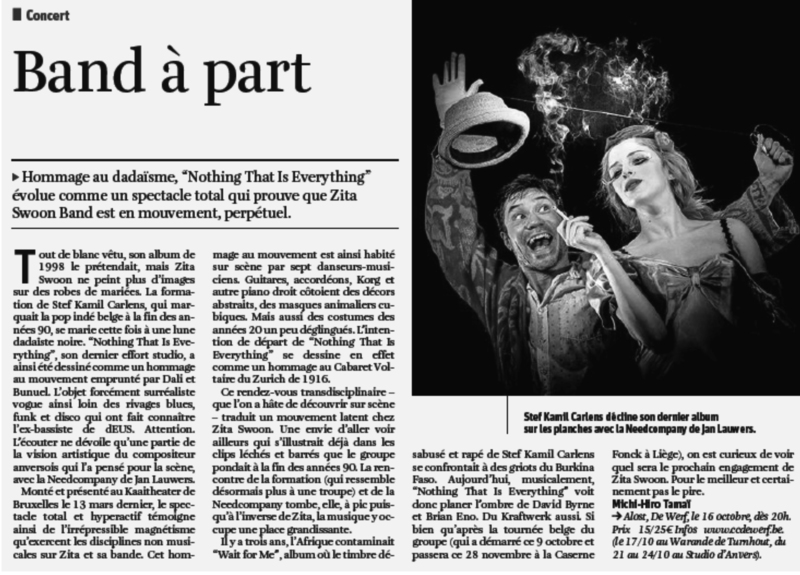 There are all the elements which they use: visual work in décor, and masks, costumes, dance, music, rhythm, poetry, confusion (of language) and humor. 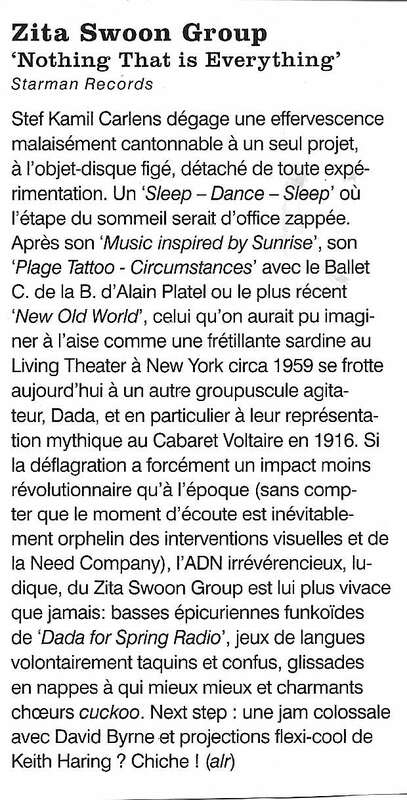 For this new production they have collaborated with Jan Lauwer’s Needcompany. In 1998, Stef Kamil Carlens wrote the song “One Perfect Day”. In the booklet accompanying the CD “I Paint Pictures On A Wedding Dress” he inserted a footnote: ‘Dada, let me in’. The text was written using the Dadaist cut-up technique. This new production unifies the worlds through which Carlens has long been roaming. 4. Why Say it Once ?